OctaFX is recognised as Best STP Broker 2015 by World News Media! The year 2015 comes to an end and there is quite something to celebrate at OctaFX! European CEO magazine published by World News Media awarded OctaFX with a title of Best STP Broker 2015. We are immensely happy to receive such a high evaluation of our services! We also would like to thank our clients for the trust and loyalty they demonstrate trading with us! We perceive this as a responsibility that OctaFX is happy to bear. Being Best STP Broker 2015 makes us try harder in 2016 to deliver excellent level of services to our clients. European CEO magazine claims OctaFX to be “celebrated for its technological prowess, and also known for its outstanding knowledge of the forex industry, and its ability to cater complex clients needs”. We are glad to answer industry’s highest standards. More about European CEO and World News Media: World News Media is a leading publisher of quality financial and business magazines, including European CEO. By recognising what it is that differentiates the best from the rest, the European CEO Awards offer an insight into where the European climate for business is headed. The European CEO Awards look at the most innovative names. Taking into account strategy, sustainability, profitability and a range of other factors, this year's European CEO Awards consist of only the brightest lights in business. Read about the European CEO awards 2015 here. Pick up the latest virtual edition issue of the magazine here to read more about OctaFX role in the industry. 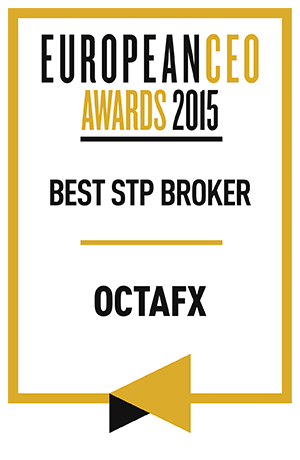 Trade with OctaFX - Best STP Broker 2015! OctaFX would like to inform you about the changes in trading hours for all instruments during Christmas and New Year holiday season. Vote for OctaFX in FX Empire awards 2015! We are proud to announce that OctaFX has been nominated for the Most Innovative Broker and the Best International Broker titles in Forex Broker Awards 2015 by FX Empire! Show your support of our service by voting here!